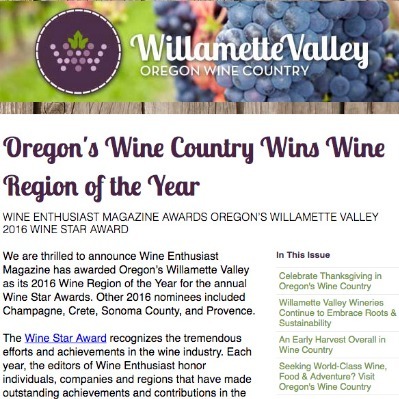 Free newsletters about Willamette Valley adventures straight to your inbox. Find getaway ideas, unique places to see and things to do on your next Oregon Wine Country escape — delivered to your inbox. Sign up for our e-newsletter today and prepare to drink it all in! When the summer sun offers longer and warmer days set out to explore trails, waterways and historical sites, plus don't miss out on exciting summer events in Oregon's Wine Country. Make your way to Oregon Wine Country to watch the trees change, hear the leaves crunch, and taste the abundance from grapes to apples to pumpkins before this magical season fades away. Winter in the Willamette Valley is not a time to hibernate. Grab your coat and boots and come explore the beautiful outdoors. Hike or hunt truffles, then step inside to warm up with a splendid meal paired with a glass of local wine, beer or spirit.